CODE THE SALON brings you a vibrant & creative hair experience like no other salon. Undoubtedly the best hairdressers in Tolworth Surbiton with a team boasting of talent and creativity. We're proud of our team of hairdressers that are qualified beyond industry standard having completed their NVQ training. further year’s training specialising in either cut or colour and learning CODE THE SALON’s unique methods and techniques. Whether you are looking for a new style, cut or colour we are passionate about hair and we believe that you deserve the best. Leader and founder of CODE THE SALON Peter Georgiou has been a part off hairdressing for over twenty years and says "progress is everything". Peter from Carshalton in surrey inspired by leading hairdressers started hairdressing after finishing high school. Peter had a perfect grounding - training form a prestigious salon in south London where Peter became a style director and then an art team member involved in editorial photo shoots, international competitions and staging prestigious hairdressing shows. Peters career then led him to work in renowned award winning salon in Knightsbridge - west London where he styled celebrities such as The Cheeky Girls, Michele Heton, Sadie Frost and Heidi Klum. His experiences also include - hair stylist at London fashion week for three consecutive years working with designers Sass and Bide, Maria Chen, Alkida and Sadie frost. And being featured in tabloids such as Cosmopolitan, Design Week and The Daily Mail, and Best magazine. 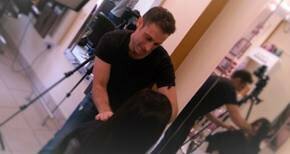 Before opening CODE, THE SALON in 2006 Peter had lead advanced hairdressing courses for other professionals. Peter’s passion and commitment thrives as he continues to head many of his own photo shoots and make overs at CODE THE SALON and is creator of a unique training programme for apprentices.